by Ryn McCoy on February 7, 2018 » Add the first comment. Guest Teaching Artist Subashini Ganesan gives a lesson in bharatanatyam dance. National Endowment for the Arts Chairman Jane Chu has approved more than $25 million in grants as part of the NEA’s first major funding announcement for fiscal year 2018. 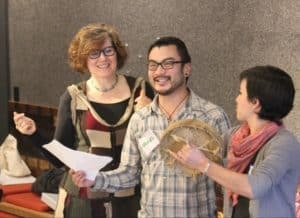 Included in this announcement is an Art Works grant to Young Audiences of Oregon & SW Washington for its Teaching Artist Studio, a professional development program for teaching artists. [TA Studio] addresses a critical need in the community for training for underserved arts educators. Young Audiences’ Teaching Artist Studio (TA Studio) is a professional development program for teaching artists in Oregon and SW Washington. TA Studio facilitators work with artists from all disciplines and media—performing, visual, literary, digital, and more—to empower them in their practice and enhance their impact on students’ lives and education. Launched in 2013, this program is the only in-depth, teaching artist–focused professional development offering in Oregon. 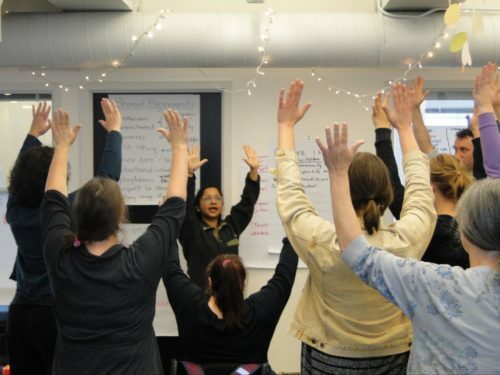 It addresses a critical need in the community for training for underserved arts educators, and builds on other local arts education training efforts. “This federal funding will leverage the generous support of our local community and ensure that more young people derive the transformative benefits of creativity in their classrooms,” said Clarke. “The impact in our region—and in kids’ and artists’ lives—will be profound.” Young Audiences’ TA Studio is also supported by the Oregon Cultural Trust this year. Founded in 1958 as an affiliate of the country’s largest arts-in-education organization, Young Audiences of Oregon & SW Washington has grown into the region’s primary provider of in-school arts programs. Young Audiences offers a wide range of artist residencies, workshops, and performances in a variety of art forms across multiple cultures to over 72,000 children each year. Since the appointment of Executive Director Cary Clarke in 2013, Young Audiences has become an even stronger and more relevant organization by launching an array of new, responsive programs. These include community-focused programs like the TA Studio, which is led by Tony Fuemmeler and Briana Linden, as well as collaborations with schools such as the Business of Music program, which pairs professional composers with a high school choir to create and perform new compositions and teach about careers in music. For more information on the Young Audiences Teaching Artist Studio, visit ya-or.org.